AJAR, Centro Nacional Chega! 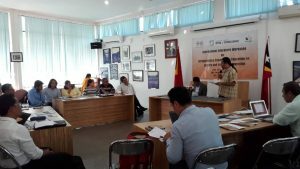 (CNC), and the International Coalition of Sites of Conscience (ICSC) conducted an “International Educators’ Workshop on Strengthening the Capacity for Education on History and Violence Prevention” on 25-28 June 2018 in Dili, Timor-Leste. The program aims to bring together educators from Cambodia, Timor-Leste, and Guatemala to improve the effectiveness, efficiency, and sustainability of each participating educational program or organization to teach about their country’s histories of conflict and atrocity. It is a part of the effort to enforce the educational component of institutional reforms under the transitional justice process. Ze Luis Oliveira, AJAR Timor-Leste’s Director, stated that the learning experiences of educators from the three countries are very essential to build peer-knowledge and to develop teaching tools for historical and memory preservation. In Timor-Leste, educators have a role to adopt “Chega!”, the report of the Commission of Reception, Truth and Reconciliation (CAVR) into the educational system. CNC has a role to disseminate the Chega! report to the public, including educational institutions. Together, AJAR, UNTL, and UNPAZ have developed a curriculum for history and memory teaching for university students. Furthermore, educators from ACbit are strengthening community history by developing an intergenerational dialogue. In Cambodia, high school teachers are developing “village history” in their communities to preserve their memory and experiences about the Khmer Rouge regime. This initiative includes a “Living Library” on the history of the Khmer Rouge, “Movie Documentaries on the Landscape of Healing”, a “Prison without Wall”, and teaching history at the classroom using theatre and role-play. These activities increase reconciliation and intergenerational dialogue in the community. In Guatemala, educators, and high school teachers create various innovative methodologies in teaching histories, including using multimedia and developing the “Iwitness” tool that highlights specific cases of human rights violations in the classroom, using art design and printings and theatre as a means of dialogue and reconciliation. Participants also learned about the transitional justice process in Timor-Leste, specifically on the context of educational reform and memorialization. Antoninho Pires, Head of the Directorate General of Timor-Leste’s Ministry of Education, Sports, and Youth stated that the Government of Timor-Leste is still continuing to develop its educational reform policies. Recently they are in the process of revising their curriculum, which will adopt the Chega! report. The government is also open to receive input from various actors, including NGOs. Participants visited the CNC office, which was a former prison and torture site called Comarca Balide in Dili. 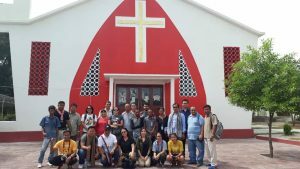 They also learned how CNC, as a follow-up institution to implement CAVR’s recommendations, could work effectively to preserve historical memory in Timor-Leste. Participants also visited the Museum of Resistance, had a meeting with survivors of the Santa Cruz November massacre, and visited the site of the Liquica massacre in Timor-Leste.